Mark Granier's second collection, The Sky Road, continues to explore themes that emerged in the first collection, Airborne - nature, death, art, love, travel - though here the road, both actual and metaphorical, is a central motif. "Mark Granier's new collection brims with prizes by this seasoned practitioner of the lyric form. As in his previous collection, Airborne, these poems demonstrate an unfailing capacity for surprise, wonder and delight at the various world we move about in; this time the idiom emerges with additional resources, such as self-deprecating irony and stylistic aplomb. The poet has been honing a fresh blade with the last century's masters and wields this new instrument with relish." "These compact, carefully crafted poems are capable of packing a considerable charge. 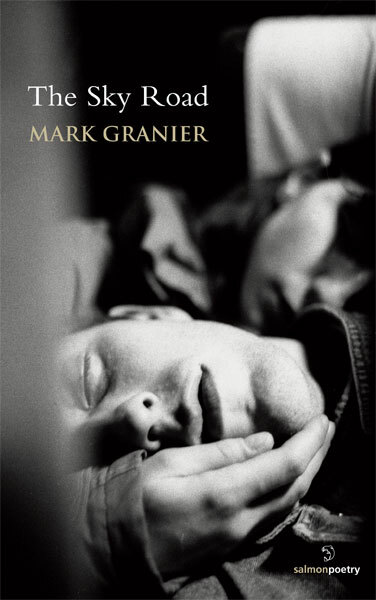 Whether writing about the natural world, the city and its phenomena or about relationships, Mark Granier weighs what he experiences with truthfulness, poise and an attractive sense of what language can do. Refusing to be hurried, he suggests by implication that the reader would do well to follow suit." "In his deft illuminations of the ordinary world, Granier shows us the thin partition dividing a chilled sense of mortality from that throbbing everyday life we live and try to be aware of. Airborne is at once buoyant and 'down to earth...', as good poems should be." angled above the sloth hour. to take in a bolt of hard blue ....."
For this reviewer, it's the wonderful and deceptively simplistic four sectioned poems making up 'Western Stills,' with titles such as 'Moon on Inis Mór', 'Approaching Dun Aengus,' 'Indreabhán, 5 a.m.', 'On The N6 which illustrate best what Mark Granier can do. Here image and feeling are fused into a photographer's imaginative but still absolute focus: an oar is 'bone-white,' a snowman is a 'thawing ghost', there is 'wave-thunder'. This is word-magic. A button-review cannot do justice to what is arguably one of the finest, most totally poetical collections of poetry this year, completely unmarred by affectation, rush, or corner-of-the-mouth smartness. They are mature. Best just go out, buy this memorable little book, sit back and let it blow through you. And congrats to Salmon for finding these poems and giving them a place to put their feet up. that has you most affronted and afraid"
... The Sky Road is a book about journeys; ... Granier's poetry strolls through Swords, drives through the Sally Gap, swims off the coast of Vancouver by night and tumbles from the deck of San Francisco's Golden Gate. A former winner of the Vincent Buckley Prize, Granier has produced a book 'nudged, absently, by the planet' itself, a collection in which Irish landscapes blend into those from around the world. 'Singapore - London - Dublin' is the title of one piece; 'Here, There' the title of another. The poet's conception of contemporary Irish identity is lyrical and globalised. The streets and boulevards of foreign capitals run seamlessly into Mount Street Bridge or the dual carriageway at Kilmacanogue, and, though the occasional flippancy of some poems here distracts, The Sky Road negotiates the slipstrem between the Irish and the international in a suitably satisfying fashion. Furthermore, and refreshingly unlike many contemporary Irish poets, Granier is unafraid to extend the international influence backwards, to a childhood defined not by Fáilte Ireland hokum but by imports such as The Man from U.N.C.L.E. and Doctor Who. This, of course, is not to say there aren't hints of a more insular past in The Sky Road. 'Our dark / island kept itself to itself,' he says at one point, but overall his willingness to acknowledge the patchwork of influences on his generation makes his recollections more sincere. Yes, the ghosts of old Ireland still wander Granier's byways, but they share the airwaves with garbled broadcasts from the BBC and with the contrails of aircraft bound for everywhere. Moreover, ... the spirits here will not easily be put to rest. They remain part of the conversation, communing with both the landscape and the poet: 'Are you dead?' Granier asks of a familiar, only to receive the ambiguous answer: 'I'm still here'. Elsewhere he reads the country's new roads like lines on the hand of the nation, following them as they take the load of a national consciousness preoccupied with notions of modernity and vacuous success. For the most part, these are poems 'delicately arranging their way', and, arriving at the many destinations of The Sky Road, Granier makes the admirable point that 'One's uneventful flight / is another's tenfold-night'.